The inverse functions of sine and cosine work perfectly in Excel. However, as soon as you want to use these in a VBA project, they stop working. When compared to a spreadsheet, Visual Basic for Applications (VBA) is very sparsely equipped with functions. Many additional functions however, can be constructed mathematically from the existing default functions. If you use the more complex functions more often, you should define these as VBA functions and save them in a generally available module. To enable the Visual Basic Editor click the ‘Office Button’ and choose ‘Excel options’. Select ‘Show Developer tab in Ribbon’ under the tab named ‘Popular’. This defines the required Pi over the existing arc function ‘arctan’. The other functions will mathematically reduce ‘arcsin’ and ‘arccos’ to ‘arctan’ with the help of Pi. If you run the VBA project directly in Excel, you can go back to the functions of the worksheet. In this variant, you do not need any self-created functions; you call up the form ‘Excel.WorksheetFunction. Pi()’ instead. Set the known spreadsheet after ‘Excel.WorksheetFunction.’. The only prerequisite for this is that the reference to the respective library is activated. This is the default setting in Excel. To check, open the VBA editor and then the command ‘Tools | References’. 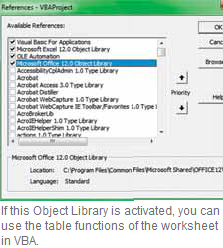 The option ‘Microsoft Excel 11.0 Object Library’ must be activated in the list.